I love salted caramel, I think it might actually be my favourite food. 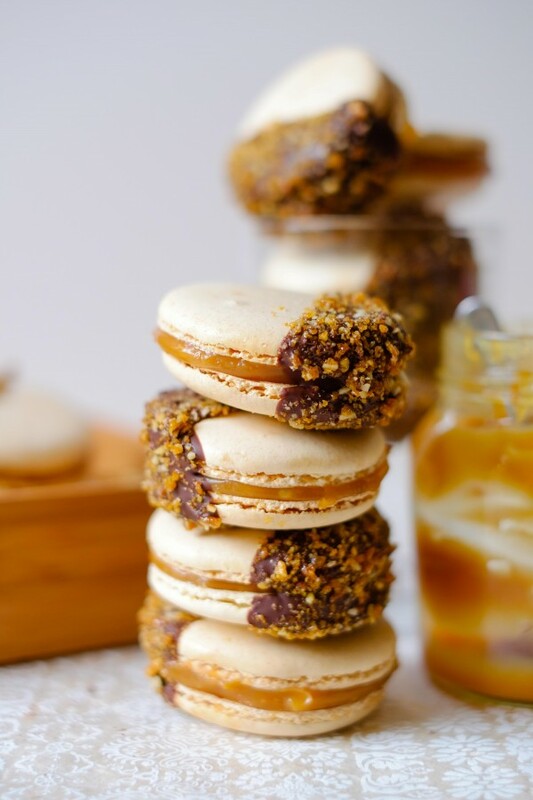 I’ve used it a LOT on Patisserie Makes Perfect, this is actually the third time I have featured a salted caramel macaron recipe here. 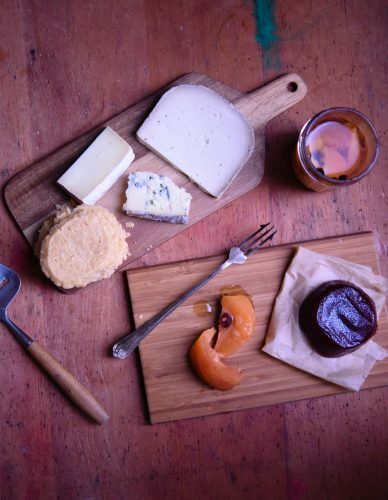 I’ve made it into sweets, used it in my Stout and Salted Caramel Opera and baked it into tarts. I even have a Pinterest group-board dedicated to Salted Caramel. I can’t promise that this will be the last time salted caramel will feature on the blog, but I do promise after this post, I won’t go on about these macarons anymore. That doesn’t mean I’ll stop making them, they taste fantastic. Sorry if I sound a little smug, but I think they look pretty good too. I also thought that these special macarons deserved a special chocolate, one of my favourites Valrhona. These macarons have a tendency to be very sweet because of the combination of meringue and salted caramel. I decided that they’d benefit from 70% cocoa chocolate as a coating. The praline adds an extra layer of sweetness too, so this stronger chocolate was definitely a good choice. Macarons are very popular and they don’t seem to be going out of fashion any time soon. 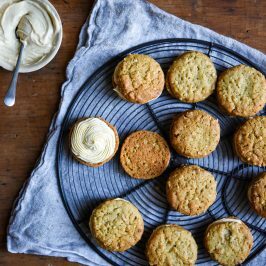 The flavour possibilities are virtually endless and even savoury versions of this delicate treat are being created. There’s many a wedding where macarons have taken the limelight instead of the more traditional fruit cake. I can understand why. I made these macarons slightly larger than usual, so they are more like the size of a biscuit than the usual smaller 3cm variety. 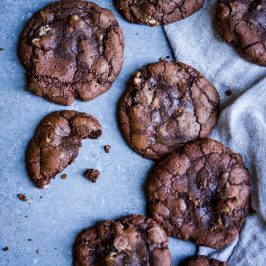 It does mean the recipe makes less macarons, however you really need the larger size to make them easier to dip in the chocolate and praline. It’s also really important that you chill your macarons for around an hour (or 20 mins in the freezer – but no more) before dipping them, otherwise they slide apart and you’re left with a messy puddle of macaron – trust me, they’re still very edible though. If like me, you’re a bit salted caramel obsessed you might want to take a look at this Salted Caramel Chocolate Cake, or there’s Salted Caramel Rice Krispie Treats for when you need a fix in a hurry. Or how about these Salted Caramel Brownies if you’re still left wanting more, try this Honeycomb Crunch Chocolate Cake. 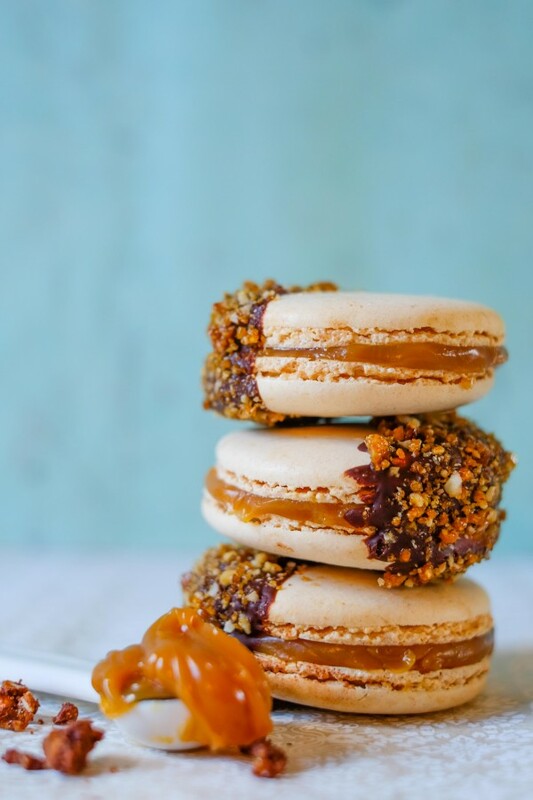 Here’s the recipe to make what I think is the prefect Salted Caramel Macaron. 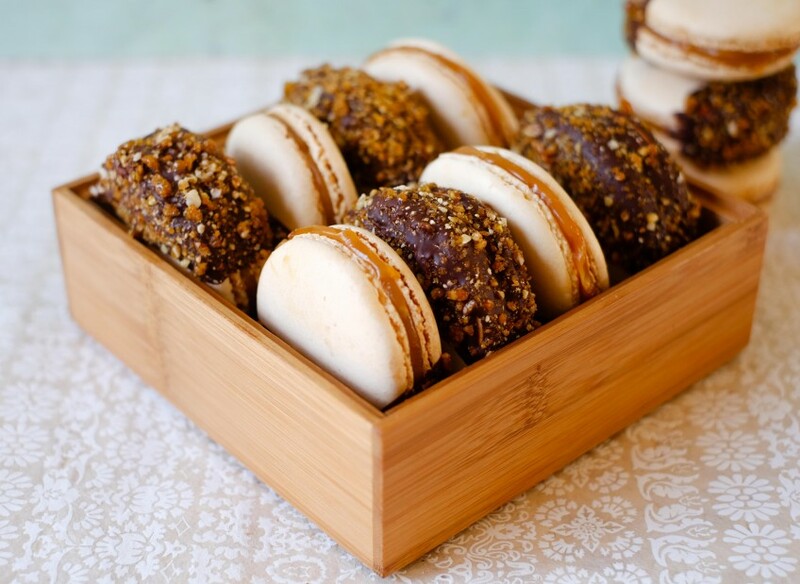 A delicious salted caramel macaron, dipped in chocolate and coated with praline. Preheat the oven to 170C Fan and line four baking trays with baking parchment. You can use these macaron sheets as a guide when piping out 5cm circles. Put the macaron mix into a piping bag and pipe out 48 macarons. To make the praline, line a baking tray with greaseproof paper. You will spread your praline out onto this. Heat the sugar in a pan until it turns liquid and golden. Stir in the nuts, working quickly to coat everything, pour the praline out onto the tray and allow it to set. When the praline has set, tip it into a food processor and blitz until the praline is crushed and resembles breadcrumbs. 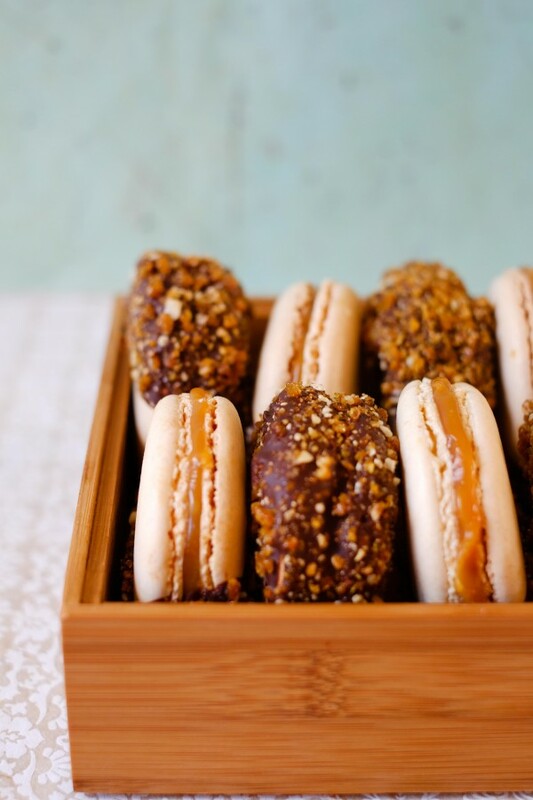 Then sandwich the macarons together with the salted caramel and place them in the fridge to chill and firm up, you want them quite cold for dipping in the chocolate, otherwise they will separate. Melt the chocolate and then let it cool to around 30C, place the praline in a separate bowl. 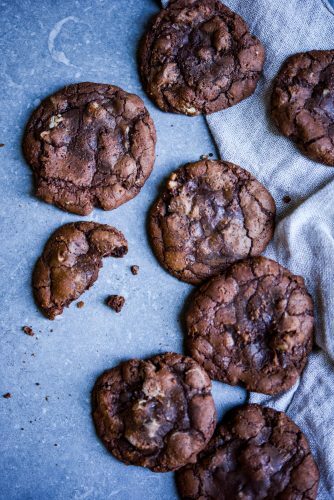 Take the macarons, dip half of them in the melted chocolate and then coat the melted chocolate with praline, place them on some baking paper to set. Macarons are usually best left in the fridge for a few hours before eating, so that the shells can soften up. 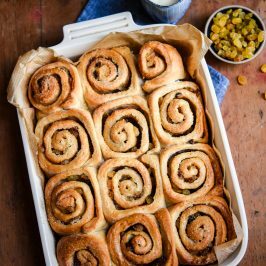 I’ve added this to Fabulous Foodie Fridays and Treat Petite with Cakeyboi and The Baking Explorer. 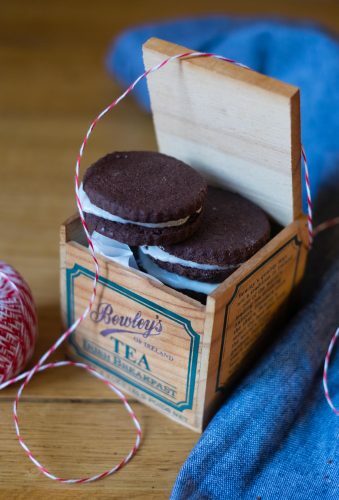 I don’t normally comment on these types of things but I do like this flavour combination and will use it but there are a couple of technical issues I found in the recipe and if people are using it then their macarons won’t turn out if these are left out. 3. This important step was missed. You need to dry the macarons for 1/2 hour to an hour before you put them in the oven or they won’t get their ‘feet’. Thanks for your comment, I understand that you are not normally supposed to stir sugar when making caramel, but I don’t know if it is my pans, but I quite often get hot spots in my caramel and so I have had burning before. I have stirred caramel and never found crystallisation to be a problem, especially when making a sugar syrup like this for meringue. With regards to point number two, I just mix the macarons until the texture is the one I need, however now you mention it, it is like ribbon stage, so I will remember that in future. Lastly, I did not miss out the stage where you rest the macarons for 30 minutes, I just don’t do it. I have tried this before and I find with Italian meringue macarons it really doesn’t give any benefit or affect the feet on the macarons. Obviously if this is something you want to do, feel free, but I don’t think it’s necessary. 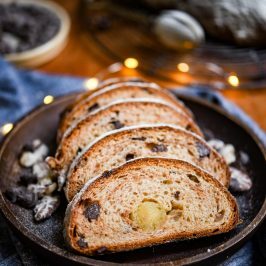 I hope you enjoy the recipe and have great success with it. Caramel is available all year round here too, it’s just more prominently displayed during the fall. Caramel apples are a popular Halloween party treat. Good thing you can make your own! Please hold me down and jam about 100 of these in my mouth! YUM! They are so good Jennifer! I had a bit of a binge on these too. Thank you so much Helen. Salted Caramel Macarons are probably my favourite, that explains why I’ve made them 3 times alone on the blog already. Thanks very much for hosting Treat Petite and for stopping by. 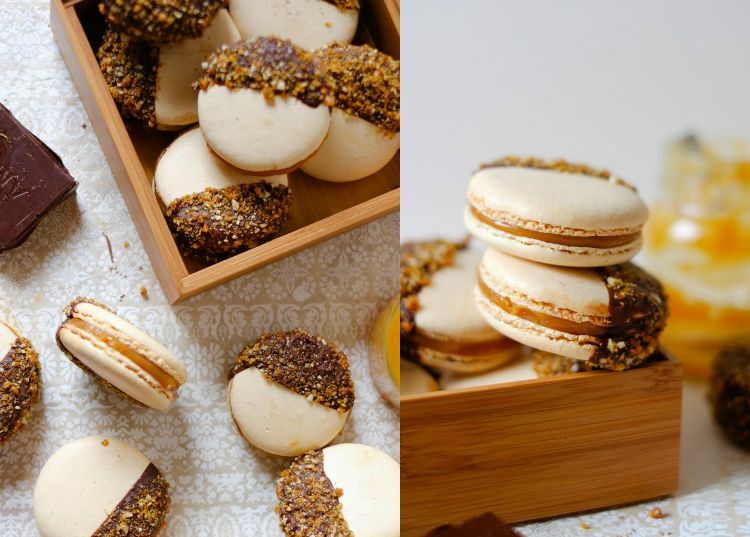 I loooooove salted caramel in baking, who am I kidding I love it full stop and these macarons look amazing! Thank you Lauren and thank you for hosting Fabulous Foodie Fridays! I hope you had a great weekend too. I’m so flattered you think these look good! Angela! These are absolutely gorgeous! I have been drooling every time I see someone pin/post a photo of these this week! Everything about them is just perfect. I cannot wait to make these with my Mum and sister, who are both massive salted caramel fans! And that praline crunch – perfection! Thank you so much Amy! I’m delighted to know these have been getting pinned and that they are having the desired effect. Let me know how making them goes, they are so delicious, it’s hard to wait for them to be assembled before eating them! These look so impressive, I too suffer from the fear of failing that Julia mentioned, with macarons. Having seen your beautiful salted caramel ones though I am going to have to try to make some now. Will read and re-read for tips! 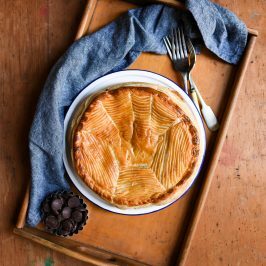 Beautiful photos too 🙂 Thank you for linking up with #PerfectingPatisserie! Thanks Louise. I ate a LOT of these, they were so nice. I really struggled to give them away! These look amazing! 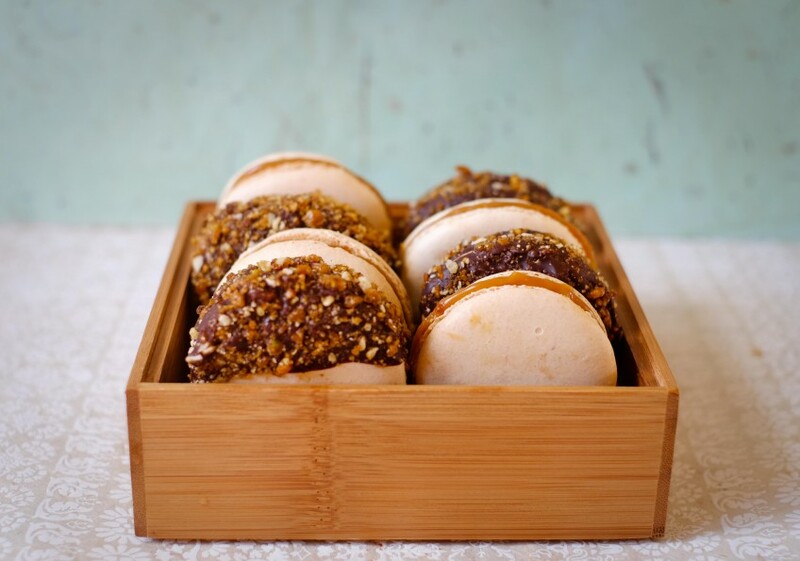 I love making macarons, but haven’t tried salted caramel before…these are on the list! I agree Cate… I ate so many of them! 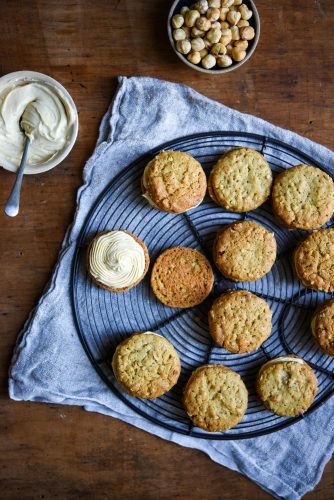 I haven’t tried making macarons yet, but this recipe might have convince me to give them a go! I love salted caramel, and you are right (and you don’t sound at all smug- although you have every right to), they do look fantastic! Thank you Sian! They’re really not too difficult, but there’s just a few things you should always do when making them. I used Italian Meringue to make mine, I always use a template for piping them and tap the tray before baking to remove any air bubbles. You should definitely try them! 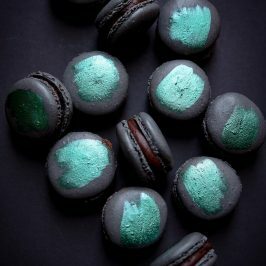 As you know I am a sucker for both macarons and salted caramel so these are pretty much my dream treat. They look so professional too – can’t wait until the shop opens Angela! My design skills are at your disposal! Oh Angela, these look absolutely stunning. I have never made macarons myself, I don’t like the idea of failing but seeing these beauties I think I need to try as I love eating them SO MUCH!! Pinned! You should try them Julia, you’d ace them! I love eating them too, they are the perfect mix of soft and crunch and sweet etc. So glad you like these!